Ceiling fans make pirates happy – Run aW4Y!!!!1! The new radiation warning symbol from the International Atomic Energy Agency. I’m betting this is somehow tied to the challenge of providing nuclear waste warning symbols that will be meaningful in the thousands of years during which the waste is still potentially harmful, in addition to having possible usefulness in the present. 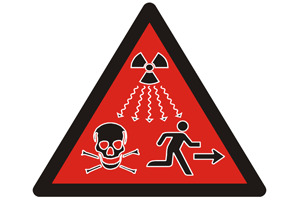 With radiating waves, a skull and crossbones and a running person, a new ionizing radiation warning symbol is being introduced to supplement the traditional international symbol for radiation, the three cornered trefoil. The new symbol is being launched today by the IAEA and the International Organization for Standardization (ISO) to help reduce needless deaths and serious injuries from accidental exposure to large radioactive sources. It will serve as a supplementary warning to the trefoil, which has no intuitive meaning and little recognition beyond those educated in its significance. So made for warning people today? I get the red warning color. Otherwise, I still think it looks as much like a warning against blowing air on pirates. And maybe making that AOL guy run away.